Enjoy a cool mountainside dip in one of the lakes or rivers of Jackson. 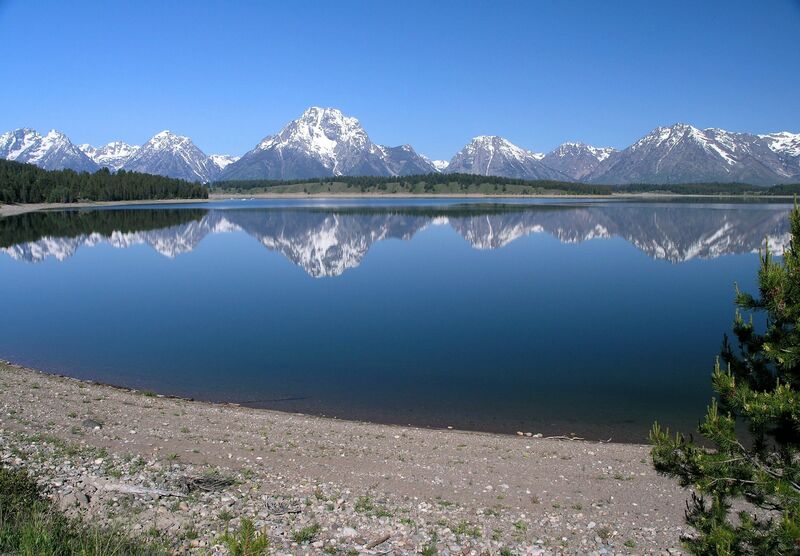 Experience the beauty of the Grand Tetons at Jackson Hole. Whether it’s winter, spring, summer or fall, Jackson, Wyoming is the place to be for wannabe’ cow folk, outdoorsmen, and extreme sports enthusiasts. 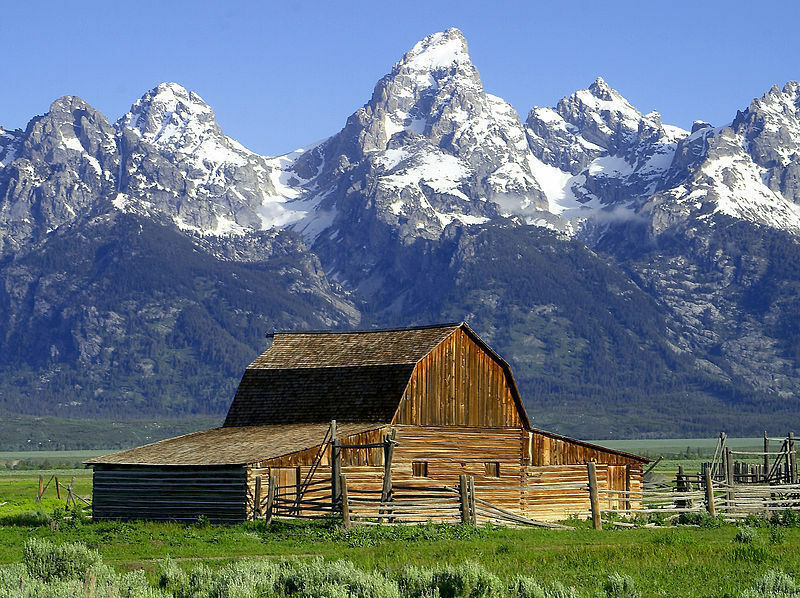 Jackson, Wyoming is a half-tamed frontier valley surrounded by an enormous variety of adventures, extreme and less extreme, within the National Elk Refuge, Grand Teton National Park and Yellowstone National Park. With more than 97% of the county devoted to protected public lands, families tend to congregate near the remarkable skiing and snowboarding, children’s programs and extreme snowsports at the Jackson Hole Mountain Resort (the area’s largest concentration of housing for visitors) or out on one of the area farms or ranches. Depending on when you visit, there’s wilderness snowmobiling (Flagg Ranch), horse-drawn sleigh rides past coyote and elk herds (National Elk Refuge), dog sledding (Moon Mountain Ranch), stunning hiking (Yellowstone and Grand Teton National Parks), outrageous whitewater rafting (Snake River), horseback riding (Goosewing Ranch), exhibits on bears and wolves (Idaho’s Yellowstone Bear World), fly fishing, and other pastimes within an hour’s drive. There’s something for every active member in your family at the Jackson Hole Mountain Resort, a multi-winner of the NSAA’s Golden Eagle Award for Environmental Excellence. Infants and toddlers will love the Kids Ranch program just for them; JHMR is a past winner of FTF’s Top 10 Getaways for Tiny Travelers award with excellent nursery care. School-age children are welcomed into the scheduled snowsports learning programs. If your family doesn’t want to ski or ride, they will enjoy exploring the town, a short drive away. The Western style Jackson Main Street with its shops and galleries is a good family destination, winter or summer. If your teens are stellar skiers who might get bored in a typical teen program, Jackson Hole Mountain Resort’s Team Extreme program might be just the ticket. Running December to March, this four-day skills program is a unique, advanced skiing and riding school for young snowsports athletes ages 12 to 17. Your teens are taught mountain and personal safety, terrain assessment techniques, and the rudiments of backcountry equipment, travel, and route finding. As part of the fun and positive mentoring, Team Extreme has had chances to show their stuff to major JHMR-sponsored athletes like Tommy Moe, Micah Black, Travis Rice, and Jamie Sundberg. Year-round, after a long-day on the slopes of skiing or hiking, families of all ages can get into the action by saddling up for a Goosewing Ranch trail ride, take in the excitement of the Jackson Hole Rodeo calf scramble, and join the cowboy camaraderie, cooking and Western music show at the Bar J Chuckwagon before heading down to the the nightly Town Square “Shootout. If that long list of activities doesn’t keep your kids entertained, shutterbugs and outdoor enthusiasts looking for adventure can team up with Teton Science Schools’ Wildlife Expeditions photo safari to encounter bison and bears in their natural habitats in the wild. Families with younger children will appreciate the visitors center open at Grand Teton’s Laurance S. Rockefeller Preserve, accessed by car or bike from the scenic Moose-Wilson Road. The visitor center is a good starting point for easy hikes to see deer and moose or explore Phelps Lake. The Grand Teton Lodge Company, a division of Vail Resorts, manages several hotels and organizes horseback rides along many trails in this area. But there’s more than just wildlife sightings in summer — sports enthusiasts can mountain bike the National Elk Refuge with Hoback Sports or try a rafting excursion on Snake River’s Lunch Counter Rapids with Jackson Hole Whitewater. Even little ones can get in on the action and take part in the Snow King chairlift ride and thrill in the fun of the 2,500-foot return trip via mini mountain bikes. Though Jackson Hole provides all the rustic fun and call of the wild families can endure, there’s also plenty of cultural opportunities to compliment an active getaway. Guests enjoy a family-friendly performance at The Off Square Theatre Company, dance classes or a movie at the state-of-the-art Jackson Hole Center for the Arts and hands-on Children’s Discovery Gallery at the National Museum of Wildlife Art. Despite the relatively recent arrival of several posh resorts, J-Ho the town is unselfconscious in its sophistication, serving he-man meals (at the Million Dollar Cowboy Steakhouse), funky bar food in a noisy setting (Mangy Moose) and tall drinks at the historic Wort Hotel. Lodging ranges from grand (Amangani) to motels to somewhere in between. The 72-room Hotel Terra in Teton Village welcomes guests seeking luxury and sustainability. It’s the very first of a worldwide collection of eco-boutiques launched by the Terra Resort Group and is located by the resort mountain’s base. Teton Mountain Lodge and Spa nearby is a family favorite for its spacious, comfortable rooms (many with kitchen facilities) and its thoughtful amenities, such as loaner toys and baby gear. Both are priced from $$ in summer to more than $$$$ at the peak winter ski season but spring and fall rates are very good value. The Cowboy Village Resort is a cute collection of 82 log cabins near the crossed antler portals of town square (about 12 miles from Teton Village). Formica and polyester create the ‘down home’ style in various size cabins. All have kitchenettes, all share a communal lounge with fireplace, Jacuzzis, a laundry room and bus access to the superb powder at Grand Targhee. Rates range from $ – $$, for a studio in spring up to a double suite sleeping six in summer; kids 13 and under stay free, breakfast included in winter rates. This company also has three other budget resorts. For a true year-round budget option, check out Hostel X in the Teton Village base development. It provides clean and simple private rooms in a big wood house near the slopes; rooms are doubles with a king bed and private bath, or mini-dorms with four singles and common facilities. Facilities include a pool table, two TV’s with VCRs, payphones, free Internet access, ski storage and a kids’ play room stocked with climbing structures and board games. There’s a laundry facility too, and a barbecue outside for summer visitors. For year-round tourist information, visit the Jackson Hole Chamber of Commerce and check out its directory of member businesses.